Samsung’s flagship device, the Galaxy Note 8 is now available at Rs. 49,900 in India. The South Korean company has announced a Rs. 10,000 cashback offer on its Galaxy Note 8 which brings the overall price to Rs 49,900. Mahesh Telecom, a Mumbai based offline retailer has tweeted this news stating that the offer will be live until May 31. The offer is available in both offline and online markets. The Galaxy Note 8 was launched in India last year at a price of Rs. 67,900. Samsung has announced various price cuts which brought its price down to Rs. 59,900. 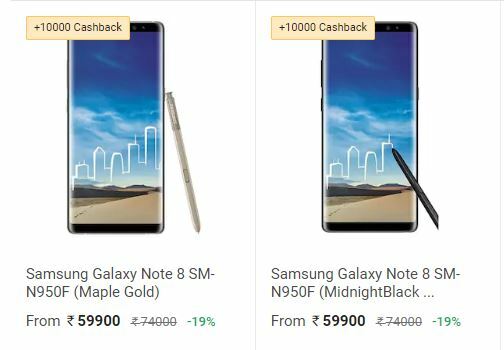 Samsung has earlier been offering cashback offers through Paytm on various smartphones as well, similarly this time Paytm cashback offer is also available for Samsung phones as well. If users want to use the offer in the offline market, they have to purchase the Galaxy Note 8 via offline retailers and make the payment through Paytm. You should note that your Paytm KYC should be done to make a payment in the offline market. While in the online market, go to Paytm Mall and purchase the Galaxy Note 8. While making the payment, apply the coupon code to get the cashback of Rs. 10,000. The cashback amount will be credited to your Paytm Wallet within 12 days. This offer is applicable only once per user during the offer period. Alongside the Galaxy Note 8, Samsung is also offering cashback on other smartphones as well including the Galaxy S8/S8+, Galaxy A8+ and more. The newly announced Galaxy S8 Burgundy Red color variant is also available at Rs. 39,990 after the Rs. 10,000 cashback from Paytm. The Galaxy S8+ price is down to Rs. 43,900 under the same offer. The mid-range Galaxy J7 Duo which was launched recently will be available for Rs. 15,990.